Pisco is distilled from hot Quebranta grape, most of which was originally produced in Peru in the early 17th century. Vina Ocucaje was founded in 1898 in an excellent viticultural zone dating back to the 16th century. Our fine cellar, located in this privileged region surrounded by smooth hills 335-Km south of Lima, takes its name from the aymara word "Okukaje", meaning "Between Hills. 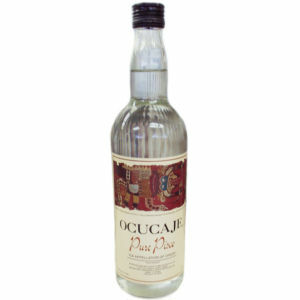 To commemorate its 105th anniversary, Vina Ocucaje S.A. presents this very special high quality Pisco.